Reading “Tropical Truth”, Caetano Veloso’s account of the origins and development of the Tropicalist movement, it became apparent that only two of the musicians usually associated with Tropicalia (Veloso himself and Gilberto Gil) took part in defining the movement as a social/political/aesthetic whole. Sao Paulo’s Os Mutantes came off as the hip, urban teenagers whose familiarity with the new sounds arriving from the USA and England made them fit in perfectly with the sonic picture Veloso and Gil had envisaged for Tropicalia. Tom Zé was always too much of his own man to follow any manifesto other than his, and Maria Bethania (Veloso’s younger sister) always seemed to be at pains to distance herself from the movement. The remaining member of the core group of Tropicalist musicians is Gal Costa, an outstanding singer who was first heard on record in a series of bossanova EP’s under the nom-de-disque Maria Graça (her real name) around 1965-66. Costa, like Gil, Veloso, Bethania and Zé, had been born in Bahia and was already earning herself a name in Brazilian musical circles as one of the most promising vocalists to emerge from her generation. Her first recording as Gal Costa is 1967’s “Domingo”, a shy, charming bossanova album which was also the debut of Caetano Veloso (regarded by many at the time as more of a theorist and composer than a performer in his own right). Nice as it is, nothing in “Domingo” could prepare those who were listening to what was to come in the following two years. In 1968 Veloso releases his first album “Tropicalia” which, along with Gil’s releases of the time, set the guidelines for the Tropicalist manifesto in terms of sound - an unique blend of Brazilian popular song, bossanova, Beatles-derived psychedelia and (especially in Gil’s case) Hendrix-inspired afrofuturism. 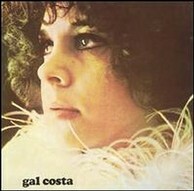 (Gal makes a short appearance in one of the standout tracks of the album, “Clara”). Tropicalists always had a troubled relationship with tradition: on the one hand, they were scholars in 20th Century’s Brazilian music, looking back to revered but slightly neglected figures from the 1930’s such as Orlando Silva and Noel Rosa; at the same time they stubbornly fought against the musical scene’s purism, and their defence of contemporary Anglophile artists such as Roberto Carlos, as well as their love of pop culture, got them into trouble from the very first day - this was, after all, the country where demonstrations were being held by fellow musicians against the use of electric guitars! By the end of 1968 most Tropicalist musicians had already started successful and notorious careers; only Costa remained in the shadows, stuck in the frustrating role of best-kept-secret of Tropicalia. By then she had already started to incorporate to her ethereal, pitch-perfect style the not-so-ethereal influence of the likes of Janis Joplin and James Brown, two artists worshipped by all Tropicalists. The first symptoms of her newly-acquired style showed in her performance of “Divino, Maravilhoso”, a song written by Gil and Veloso for her as the opening tune of the eponymous TV show that acted as a weekly showcase for the Tropicalist group. This song, along with eleven others, is included in her 1969 self-titled debut album. Now I’m going to find it difficult to stay neutral and objective, as I consider “Gal Costa” not only the best of Tropicalia’s recorded output and one of the all-time peaks of Brazilian music, but also one of the best pop albums released anywhere, anytime. It is the combined effort of three outstanding songwriters at the height of their powers (Veloso, Gil and Zé), a wildly talented arranger/producer (Rogerio Duprat, more of which later) and a vocalist who is still regarded today in Brazil as one of the very best of the last 100 years (no small feat considering the amount of excellent singers that country has spawned in that period). The opening track is Veloso’s “Nao Identificado”, which would be released in the author’s version soon afterwards as part of his “Caetano Veloso” album, when he was already exiled in Europe. Much as I love Veloso’s discography (for one thing, it has remained much more consistent than Costa’s), I believe her renditions of Veloso’s material on this album are in every case the ultimate versions of those songs, leaving Veloso’s originals sounding just as tentative efforts. And please let me insist, Veloso’s stuff is great and I’m a devoted fan of his. But what she does with songs like the aforementioned “Nao identificado”, “Lost In The Paradise”, “Saudosismo” or “Baby” (something of an anthem for the Tropicalia group, having been recorded by Os Mutantes, Veloso and Costa) is just something else. One important reason why her version of “Nao Identificado” (“Unidentified”) stands out is the work of the album’s arranger, Rogerio Duprat. Coming from the academic world of 20th Century electroacoustic composition, Duprat was a bespectacled gentleman, ten or fifteen years the elder of the Tropicalists, who had convinced himself of the inanity of “serious music” and had found in Gil and Os Mutantes the perfect allies for a much-desired foray into the world of pop music. He shared with them a love of the experiments conducted by the Beatles on their 1968’s white double album, but the role he played on their albums as a producer and arranger reminds me not so much of George Martin as of that other maverick Charles Stepney, who was more or less at the same time bringing Henry Cowell’s ideas into the music of the likes of Rotary Connection, Minnie Riperton and Ramsey Lewis, and subsequently adding a whole new dimension to what would have been otherwise pretty average hippy/ jazzy soul records. It’s no surprise, then, that the album opens with what sounds like the deafening sound of two galaxies clashing, before a sweet organ line introduces the song and Gal mutters the first line: “I’m going to write a song for her...” (obviously original lyrics are in Portuguese - I’ll do my best when attempting some translations here). The song continues, slowly paced, until the chorus arrives with the most atonal, disorientating string arrangement one could think of, providing the first of Duprat’s many genius strokes throughout the whole album. This somehow sets the tone for the rest of the songs: a seductive mix of wayward ideas, gorgeous tunes and great singing, which is probably a classic recipe for all the best leftfield pop music, but I don’t think it has ever been heard like this, before or since. You got to be alert and strong! There’s no time for fear of death now! The band acompanying Gal is fantastic, although the musicians remain uncredited in every reissue of the album I’ve seen so far. Gilberto Gil is probably present, playing fuzz guitar and shouting his way through some of the tracks (Veloso was not allowed to play by any Brazilian recording engineer at the time, and he only got his break as a guitar player while recording his exile albums in London two or three years later). The group who was backing her for live shows around 1969 was apparently Os Brazoes, a psychedelic underground quartet whose first, self-titled album sounds somewhere between the wildest moments of the Spencer Davis Group and early Pink Floyd, but with a Brazilian flavour; among this band’s members were beautifully named characters such as Brazilian Octopus and keyboard player Mandrake. It is likely that they were also backing her for this album, providing a sound which is truly psychedelic and very much of its time, but also full of subtlety, as befits the melodic complexity and harmonic freedom of these songs (this is Brazilian music, after all). The album’s rockers, though, are the non-Tropicalist penned titles: two soulful stormers written by Roberto and Erasmo Carlos (“Se Você Pensa” and “Vou Recomecar”), Cavalcanti’s “Sebastiana” (at the end of which she jams with Gil, both of them chanting the word “Epsilon” through a maze of delay) and “Que Pena (Ela Ja Nao Gosta Mais De Mim)”, a gorgeous, breezy duet between Costa and Veloso written by Jorge Ben, the afro samba innovator responsible for classics such as “Mais Que Nada” and “Pais Tropical”. The Tropicalists made no secret of their admiration of Ben, probably more than any other fellow Brazilian musician of their time. Amazingly, Gal would outdo herself in terms of far-out adventurousness in that same year, releasing her second album “Gal”, a wild psych-funk masterpiece which deserves a review of its own. Nevertheless, “Gal Costa” remains one of her peaks, a collection of great, joyful, innovative tunes sung, played and arranged like very few artists (in Brazil or elsewhere) have ever proved capable of. For anyone interested, this album shouldn’t be too difficult to track down on CD (and even on vinyl) nowadays. It is worth the hunting indeed.